JackPot's fabric is an extremely strong and highly U.V. resistant non-woven polypropylene fabric that promotes the phenomena of air-root pruning. The benefit of air-root pruning is simple -- it prevents roots from hitting a rigid container side wall, being deflected, and creating an inefficient and often fatal root system of spiraling and ever-increasingly larger roots with little or no branching. Instead, JackPot-grown plants get the benefit of air root pruning -- when making contact with the fuzzy interior sidewall of the JackPot, roots usually grow straight into the sidewall of the Jackpot until they encounter air. This naturally causes them to branch into a masses of small lateral fibrous roots (air root pruning). 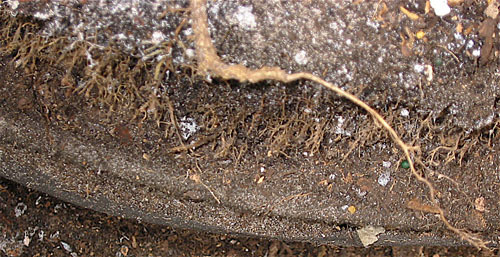 These masses of small lateral fibrous roots allow for much greater uptake of nutrients and water than the inferior large root created by conventional rigid containers. The ability to uptake more nutrients and water is clearly a superior method of growing any type of plant or tree.